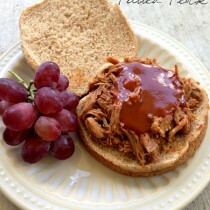 An easy slow cooker recipe for pulled pork, using all natural ingredients. Whisk together all ingredients (minus pork) in a medium bowl. Place pork in the slow cooker and pour mixture over meat. Take meat out and shred with 2 forks. Return shredded meat to slow cooker and cook for 30 more minutes. *** If making this as a freezer meals, combine all ingredients MINUS the apple cider vinegar in a large gallon freezer bag. When ready to cook, thaw completely and add in the apple cider vinegar.